Well, since someone seems to be asleep on the job, I'll take over this week. 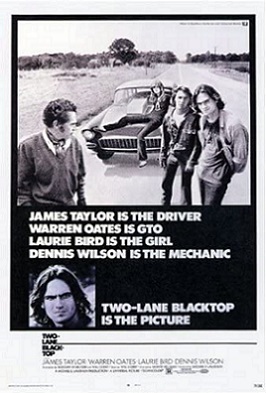 Two Lane Blacktop is a movie released in 1971 that follows the story of two drag racers that live both life both on the edge, and on the road in their 1955 Chevy Bel Air. The pair make their living by challenging the residents of the towns they come across to races. Their journey takes them East, starting from Needles, California on the historic Route 66. The movie is widely appreciated for its stark footage and minimalistic dialogue that places it along side other films such as, Vanishing Point and Easy Rider. Even though the film was not an instant hit when first released, it has evolved into somewhat of a cult classic. Also, according to a "Drive" magazine I scooped from a transmission shop, 3 purpose built 55's were used for the movie. They were built by West Coast fabricator Richard Ruth, two of which were identical to his own street driven 55 Chevy, and the third was used for stunts. After the movie, one of the main cars was sold to a studio employee, constantly changing owners before current owner Walt Bailey tracked it down in Canada. The other two were later used in the filming of American Graffiti. The lost '55 that Bailey recovered was sitting just as it was when it was built: tunnel-rammed 454, M-22 Muncie 4 speed, Olds rear, fiberglass tilt front end, fiberglass doors and trunk lid and Lexan side and rear windows. The '55 Chevy is street legal and driven regularly. In 2009 the Chevy was displayed at a James Taylor concert (one of the main stars - the Driver) where he was able to sit behind the wheel of the monster for the first time in 40 years. If anyone in the Kentucky area is interested in viewing the car, it is supposed to be on display at the 9th Annual Holley NHRA National Hot Rod Reunion at Beech Bend Raceway in Bowling Green, KY, June 16-18. Of course, there are probably a lot of attempted clones, so I'll try to post original photos. 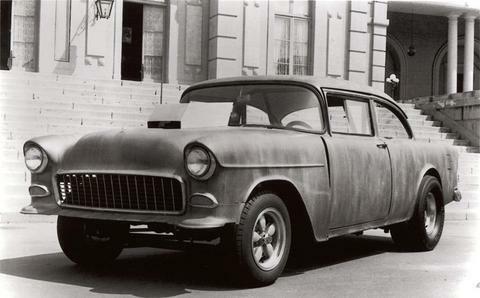 Shouldnt that be... Two Lane Blacktop/American Graffiti '55 chevy? Perhaps, but I think TLBT is a superior film. Not to mention, the end of my article was centered around the car that wasn't used on the latter film.